Malnutrition is widely prevalent in India. Improper complementary feeding (CF) practices contribute to child malnutrition resulting in growth failure, high morbidity and mortality. Objective of the study was to assess CF practices and associated factors among children (6-23 months) in rural India. This cross-sectional study was conducted with mothers of eligible children. Mothers were identified using systematic random sampling and only those who consented to participate and were permanent residents were included. Children whose mother was unavailable were excluded. Data on socio-demographic, maternal characteristics and CF indicators was collected from June to October, 2017.Data was analyzed using SPSS. Mothers of mean age 24.98+3.91 years participated. 58.3% of mothers terminated breastfeeding before recommended duration. Of 85.3% children that received CF, 35.9%, 45.6% and 18.4% children had timely, early and delayed CF. Risk of untimely introduction of CF was higher among children of general category. Maternal education, religion, family type, child‘s gender, birth weight and birth order were not significantly associated with untimely CF practices. 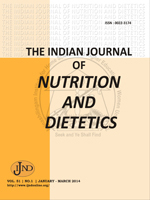 A large proportion of children did not consume sufficient diverse complementary foods to meet energy and micronutrient requirements. Study findings show that CF practices were suboptimal. Considerable gap existed between WHO recommendations and breastfeeding continuation, initiation of CF and meal frequency and quantity. Behavioral interventions involving mothers may improve CF practices and ensure better survival.